When the two largest parties in India hold their strategy sessions almost simultaneously, there can be no doubt that India is in election mode. The incumbent Congress Party and the opposition Bharatiya Janata Party (BJP) held their respective meetings this past week to formulate electoral strategies for the 2014 general elections. Reeling under the unprecedented success of the Aam Aadmi Party (AAP, or the Common Man’s Party), both the major political parties spelled out their visions and ideas . Most of the attention was on the Congress Party: there was a great amount of curiosity as to whether the party would anoint Rahul Gandhi as its Prime Ministerial candidate. The grand old party ducked popular demand from its cadres, who gathered in the national capital from all over the country, and fell short of declaring the 43-year old leader as its candidate. Rather, it made him chief campaigner for the party; that means that the Congress will contest the elections under his leadership without necessarily putting him at the top of a ruling alliance should they win. 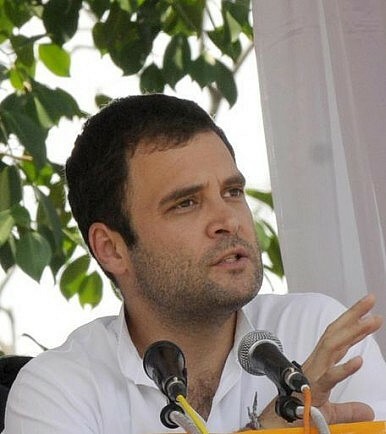 The decision not to project Gandhi as the prime ministerial candidate was made by the Congress Working Committee (CWC), the highest decision-making body of the party, on Thursday – a day before the party deliberated on the issues and strategies that it needed to galvanize its cadres and attract voters. Sonia Gandhi, Congress Party president, opposed the move to present her son as the prime ministerial candidate, citing the party’s tradition of electing its leader after elections. Political analysts, however, have a different take. They argue that the ruling party does not want to turn the 2014 elections into a popularity contest between Rahul Gandhi and Narendra Modi, the BJP’s declared prime ministerial candidate. According to certain analysts, this would mean playing into the hands of the opposition, which wants the poll to become a clash of personalities, not ideas. The party meeting saw a combative Gandhi taking his BJP opponent head on and tearing into the rival’s political ideology and thought. A crisis of leadership is one problem that the party is facing, but a larger problem is the anti-incumbency mood across the country built up against the Congress after ten years of rule. The recent assembly elections, where the party lost in four out of five states, demonstrate the intensity of anti-Congress sentiment prevailing in parts of India. The major challenge that the party faces is not from the resurgent BJP but from a rising AAP that threatens to engulf the party’s traditional base and support structure. In the Delhi Assembly elections, the nascent party decimated Congress and emerged as the second largest political group in the assembly, reducing the ruling Congress to third place after 15 years in power. With elections just four months away, the mood among Congress cadres gathered at the Talkotara stadium in Delhi was anything but upbeat. The party is passing through the worst phase in its life since coming to power ten years ago. Rahul Gandhi is attempting to galvanize support through his pep talks but, ultimately, the Congress will have to struggle to make its presence felt at the national level. The mood, however, in the BJP conclave was very surcharged. With Narendra Modi as its candidate, the party sees a real hope of reclaiming power after ten years under Congress. For the first time after being declared the prime ministerial candidate of the right-wing party, Modi laid out his plan for India if he comes to power. He not only mocked Congress for its failure to declare a PM candidate but also attacked the ruling alliance’s secular agenda. But the BJP does not have only one political enemy to tame; it now has to contend with the AAP. With the anti-corruption party in ascendance among urban voters, a constituency on which the BJP depends heavily, Modi’s march to Delhi faces a new potential hurdle. Analysts say that even if the AAP manages to get 20 to 30 seats in urban centers across the country, it could significantly damage Modi’s prospects. In the meantime, the AAP government in Delhi has become a prisoner of its own methods. It is finding it tough to transform itself from an activist outfit to a governing body – as a result, it is getting negative press within the first month of assuming power. The coming few months are going to be crucial for the party as it tries to maintain political momentum. It is planning to contest around 400 seats in the next parliamentary elections. Modi might be charging ahead, but the goalpost remains as elusive to him as before. Crossing the 272 mark out of 545 seats in parliament is still a long shot for the BJP. If the Congress manages to form a greater coalition of secular parties, as it is planning, then the task for the right-wing group becomes even more challenging. For the AAP, the coming elections will demonstrate whether the party is a one-time phenomenon confined to Delhi only or something greater. If it fails to make its presence felt in any significant way, the Arvind Kejriwal-led organization will face an existential crisis. For Rahul Gandhi, this is the toughest battle so far. He faces not only the burdens of history but also the burdens of anti-incumbency. Honest intentions are not enough to stem the tide of anti-Congress sentiment. A poor performance by the Congress in 2014 will raise further questions about his leadership and political future. The parliamentary elections will also reveal whether India is ready to accept Narendra Modi as its prime minister. If the controversial right-wing leader succeeds, it would signal the country’s departure from the Nehruvian model of secular politics. If Modi fails instead, it will raise a question mark over his future and he might have to resign from his current position as the Chief Minister of Gujarat.